Availability 8 pcs. at central warehouse. Kan afhentes i butik (Struer) eller sendes til dig indenfor 1-2 hverdage. 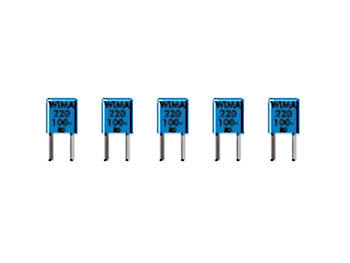 WIMA capacitors have reliable internal end terminations. They use a simple concept : the wire makes electrical contact with the complete surface of the electrode, which ensures minimal inductance. This results in capacitors with a good attenuation og self-resonance (see technical data og graphs). Miniature-type capacitors PCM 5mm. Polyester film, film/foil. Test spænding: 2 Ur, 2 sec.